SCVHistory.com | William S. Hart | Hart's Introduction to 'My People the Sioux' by Luther Standing Bear, 1928. Introduction by William S. Hart. "My People the Sioux" by Chief Luther Standing Bear. Boston; New York: Houghton Mifflin Co., 1928. One must wonder whether William S. Hart read Chief Luther Standing Bear's 1928 autobiography before he wrote the introduction for it. Hart spent years creating a professional façade of Western authenticity, based on his memories of a long-ago boyhood spent partially in the Midwest. In reality he was a method actor from New York who never cowboyed, never rodeoed, and eventually turned into the character he developed for the stage and screen. 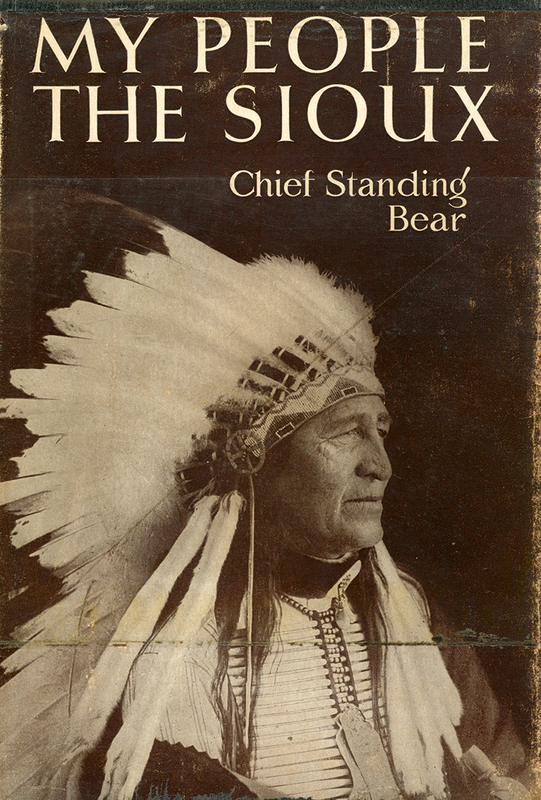 For whatever reason, Hart used the opportunity of introducing Luther Standing Bear's autobiography to chide posers who didn't truly know the West they depicted or "put on the map" — fellow east-coasters Theodore Roosevelt, Frederick Remington and (especially) Owen Wister, author of the 1902 novel, "The Virginian." Perhaps it was predictable. By 1928 Hart was a bitter man. He'd been pushed out of an industry by film producers who could no longer market his brand of moralistic melodramas that had played so well during World War I, when "right and wrong" were high on the minds of American movie audiences. The war over, audiences wanted to breathe. They wanted the thrills and excitement that Tom Mix and Hoot Gibson were giving them (and who, ironically, had authentic cowboy and rodeo backgrounds). Hart's introduction appeared in the original edition but was justifiably omitted from subsequent reprints — justifiable on many levels, from the language he used to his lack of knowledge about Luther's formal education (which far surpassed his own), as the reader will see below. Unlike Hart's own autobiography, Luther's autobiography, "My People the Sioux," is still published today — without Hart's commentary. Luther Standing Bear knew the West when it was still tame. Born in the 1860s in South Dakota, he was named "Plenty Kill" (Ota Kte) by his father, a Brulé Lakota chief with plenty of kills under his belt (or, notched on his coup stick). He was raised in a traditional way that was soon shattered. His experiences would fill a book (and they do; we can't give it justice here). He was the first boy to enter the Carlisle Indian School in Pennsylvania where he took the name Luther, and where he tried, and succeeded, in doing well in order to make his father proud. Like his father (and like author Helen Hunt Jackson*), he supported the 1887 Allotment Act (aka Dawes Act) because he saw land ownership as a pathway to U.S. citizenship, which was denied most Indians until 1924. (With a century's hindsight, the Allotment Act is seen as having been detrimental to Indian land ownership.) He spent a season with Buffalo Bill's Wild West Show and performed for the king of England; given Luther's formal education and his natural, inherited leadership abilities, Col. Cody put him in charge of the other Indian performers. In 1905 he was named chief of the Oglala Lakota — a position he held only briefly. Reservation life and second-class citizenship were not for him. Eventually he came to California where he met film producer Thomas Ince, who hired him as a consultant (but, from Luther's autobiography, Ince must not have listened too well). His first screen credit was for the 1916 film adaptation of H.H. Jackson's "Ramona" (a lost film). He appeared in the 1921 Hart vehicle, "White Oak," and the two men evidently maintained a friendly relationship as seen here. Here's the "but." Luther doesn't devote many pages of his autobiography to "Hollywood" except to say that Ince once told him: "Standing Bear, some day you and I are going to make some real Indian pictures." The day never came. "I wrote Mr. Ince that I was willing to work for my people and to help him, if he would accept my ideas and my stories. I waited for a reply, but none came." "I have seen probably all of the pictures which are supposed to depict Indian life," Luther writes in 1928, "and not one of them is correctly made." * Jackson died before the act was adopted. She was an early proponent who believed the government's "refusal of the protection of the law to the Indian's rights of property ... must cease" ("A Century of Dishonor," 1881 [Dover 2003 edition pg. 342]). A painter must know how to mix his paints and he must know how to paint, but whether he reproduces nature or makes a daub depends on his knowledge of the subject he is painting. To write of the West one must know the West. Being master of all the technique in the world doesn't give a man knowledge of what he is writing — which accounts for much of the blundering, haphazard vaporings that are written of the West. Libelous stuff, material founded on hearsay, or gathered through a smattering of ill-digested reading, which, in turn, is the output of those so full of their own confidence, they must have been bored in the writing. Here is a story written by a blanket Indian, the first son of a fighting Sioux. Aside from its beauty and naivete, the book is invaluable. It is history. The West was so big: even great men that wrote and painted what they loved could not grasp it all. Theodore Roosevelt, Frederic Remington, Owen Wister, put the old frontier on the map. These men had every attribute to illustrate the West. They were shy on only one thing — KNOWLEDGE GAINED BY ACTUAL EXPERIENCE. What a pity that such men had not lived the life of the West as Chief Standing Bear did or as Charlie Russell did! Russell's work will go down to our children's children's children — for truth looks out of the canvas. Owen Wister — great scholar, typical American gentleman — could write stories of the West that made the blood leap in the telling. How unfortunate that he had not spent more years on the frontier! Had he done so, he would never have made "The Virginian" (in his classic of that name), out of simple duty, lead a posse to run down and hang his "pardner" who was wanted for cattle-stealing. Had the Virginian been a real Westerner, had he consented to lead that posse, he would have led them in the opposite direction. And the posse would have loved him for it. The morals of the people of the West seemed to be governed by the altitude, and it is mighty high ground from the old Missouri to where the mountains go down to the sea. The author of this book may be a bit short on education. I can't say how short because I do not know enough to judge, but he has a story to tell — one that he learned IN LIFE. The tipis of his people were the first skyscrapers. Trapping and hunting was their calling, but philosophy was their life. It is a tale told of a people whipped by a stronger race — like dumb animals — for deeds beyond their understanding. I am sure that all men will enjoy and applaud their play and that no man will laugh at their suffering. General Benteen, of the United States Army, said of the Sioux Indians, "They are the greatest warriors that the sun ever shone on." We should be proud of these Sioux Indians, for they are Americans, and they come from a country and belong to a day when tongues were seldom hung in the middle, where folks didn't carry silver in their pockets until it turned black, where, if a gambler took your last dollar, he'd spend it on you, and where lots of small children were not so sure but that some angels wore whiskers and cussed a little bit.